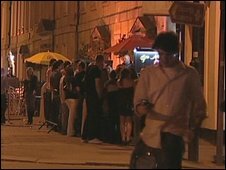 Text messages are being sent to people enjoying a night out in Bath warning them to keep the noise down and behave or to risk an £80 fine. The council said it is a better way to communicate with people aged between 18 and 30 as posters had little impact. A bluetooth transmitter sends text messages to 21 mobile phones every 40 seconds within a 100-yard (91m) radius. Messages were sent for the first time on the August bank holiday weekend and were read by 140 mobile phone users. Anti-social behaviour co-ordinator Tim Harris, of Bath and North East Somerset Council, said: "It's not just about telling people 'you can't do this and you can't do that'. "It's very much about giving out information for their own personal safety. "You've got to remember that in Bath right now we have a lot of young people coming to university for the first time. "They're coming into town and maybe staying out later than they would in their home towns - they can be very vulnerable and it's about getting that message across." People with bluetooth-enabled mobile phones will receive a text asking them if they want to receive a message from the council. If they choose to accept they will be sent the message, which will be for information only and does not require a response.